The weather, overprocessing and heated styling tools can all leave your locks looking less than healthy. Spending a ton of cash on salon treatments isn’t in the budget for everyone, but if you look in your kitchen, three staples -- olive oil, eggs and mayonnaise -- can speed up the healing process of your dry, damaged hair. Olive oil is good for your heart -- and your dry, damaged hair. It’s packed with fatty acids that coat the hair shaft, cover up the damaged layers and protect the hair from further damage. To use olive oil on your hair, warm about 1/2 cup of the oil in the microwave for 20 to 30 seconds or until it’s warm. Use more oil for long hair and less for short hair. For added healing power, mix in a few tablespoons of your regular hair conditioner before warming the oil. Massage the mixture into your scalp first so it’s completely covered and then dip a comb in the mixture to distribute it through the rest of your hair. Wait 30 minutes and wash your hair as usual. The jury’s still out as to whether eggs are beneficial to your health, but they certainly can work wonders on dry, damaged hair, particularly the egg yolk, which is high in protein and fats. It adds plenty of moisture to your dehydrated hair. Make a homemade egg hair mask by massaging 1/2 cup of beaten egg yolk into your dry hair. Leave the egg yolk on your hair for at least 20 minutes and then rinse it out with cool water. Don't use hot water or you risk “cooking” the egg while it’s in your hair. After rinsing, shampoo and condition your hair as usual. Mayonnaise isn’t likely the first thing you’d think of when it comes to healing dry, damaged hair, but this common sandwich spread is made with oil and eggs, so it will give your hair a much needed dose of TLC. To use, mix 1 cup of mayonnaise with 1 teaspoon of vanilla extract. The vanilla masks the scent of the mayo. Spread the mixture onto your dry hair. Wrap your hair with a warm, damp towel and leave it on for 20 minutes. After the 20 minutes is up, put a heaping scoop of shampoo in your hands and rub it thoroughly through your hair without adding any water. Do this for a few minutes to break down the oil from the mayonnaise. Rinse your hair with cool water. Shampoo and condition your hair as usual. The benefits of olive oil, egg and mayonnaise for dry, damaged hair are plentiful on their own, but mixing all three together gives your hair a triple dose of healing power. 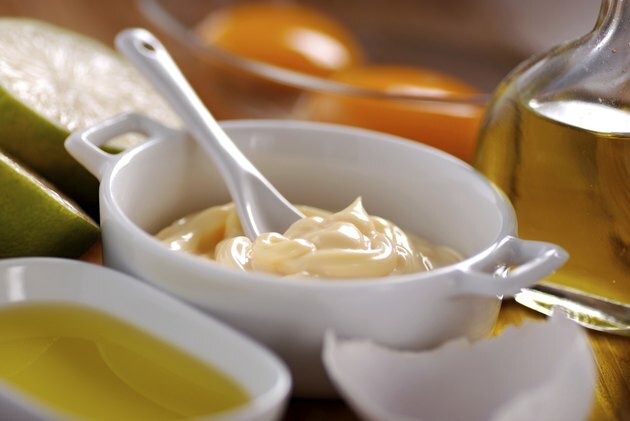 Make a homemade hair mask by combining 1 cup of mayonnaise, 1/2 cup of olive oil and three egg yolks. Apply it throughout your dry hair. Secure your hair on top of your head into a loose bun and put on a plastic shower cap or wrap your head in plastic wrap. Cover the plastic with a towel and wait 10 to 20 minutes. Rinse the mixture out well without shampooing your hair. By not shampooing, you leave a little bit of oil in your hair that will continue to condition it until your next shampooing session.